EMan's Lists. This is a frame. Please click |About| below. There’s really no redeeming value for this page (or the rest of the site, for that matter), but I just thought I’d share my favorites. Dave L.’s already cornered the market on Top Ten lists, and since eleven is my favorite number, I decided to one-up him. BTW: These may change occasionally. Typical Saturday Autobahn Morning - A9 to Munich. Note the brake lights. 11. You can stop and smell the edelweiss. 10. 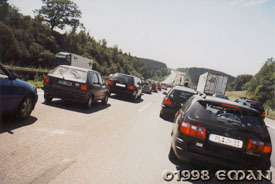 You can join the other motorists for an autobahn picnic. 9. You don’t have to move for the BMW who’s still flashing his lights behind you. 8. Have family portraits taken over by the photo-radar unit. 7. You can walk over to the Audi driver that’s been annoying you and smack him upside the head. 6. After driving so fast on the autobahn, now that you’ve stopped it feels like time is moving backwards, and you can feel yourself getting younger. 5. More time to drink beer and eat sausages. 4. Prove that Darwin was wrong when it comes to construction workers. 3. Get a chance to look at all of the speed limit signs you missed because you were driving too fast. 2. You have time to adjust your leder unter-hosen. 1. You can’t get a speeding ticket. It’s true—sensuous curves, whether on cars or women, get me everytime. But with women, I find their mind and personality just as important. Well, at least as far as you know. These aren’t necessarily my favorite groups or artists, although I obviously like them all. These are just the albums that I like to play all the way through. Can you remember those shiny, round vinyl platters? If you answer yes, then there’s a good chance you were born prior to 1980. Eleven can’t do justice to a list like this. What are your faves? E-Mail me here: and I’ll compile a “readers’ survey” list. ©1998-2003 Eclectically Vain Goodies. All Rights Reserved.